This morning the BEA released new personal income data at the state level, along with annual revisions. Overall, it brings more good news for the Oregon economy but also fits in on both sides of those two economic narratives. In aggregate, Oregon has now hit an important milestone in that inflation-adjusted personal income excluding transfer payments is now back to pre-recession levels. That’s a mouthful. 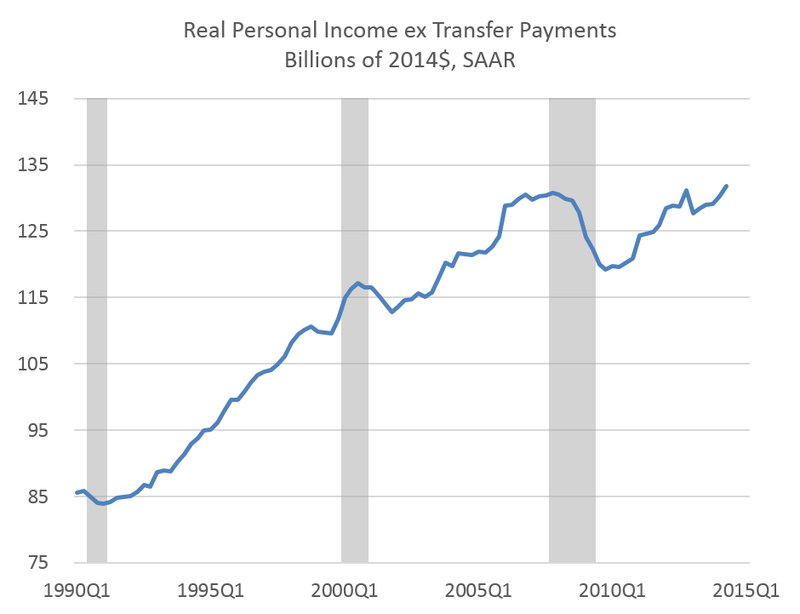 What it means is that the fundamental income underlying the economy is now back to pre-recession levels. The reason we sometimes exclude transfer payments — which serve a vital role during recessions — is that they are usually tied more to the need-based aspects of the business cycle and to an aging population with increased Social Security, and the like. The former aspect usually recedes during expansions while the latter increases steadily over time. The table shows the various components that make up personal income. Overall in the second quarter, Oregon’s income growth was the 6th fastest in the country over the past year and 12th fastest if focusing on the growth from the first quarter to the second quarter. These gains follow the state’s strong employment growth (relative to other states) in the past couple of years. 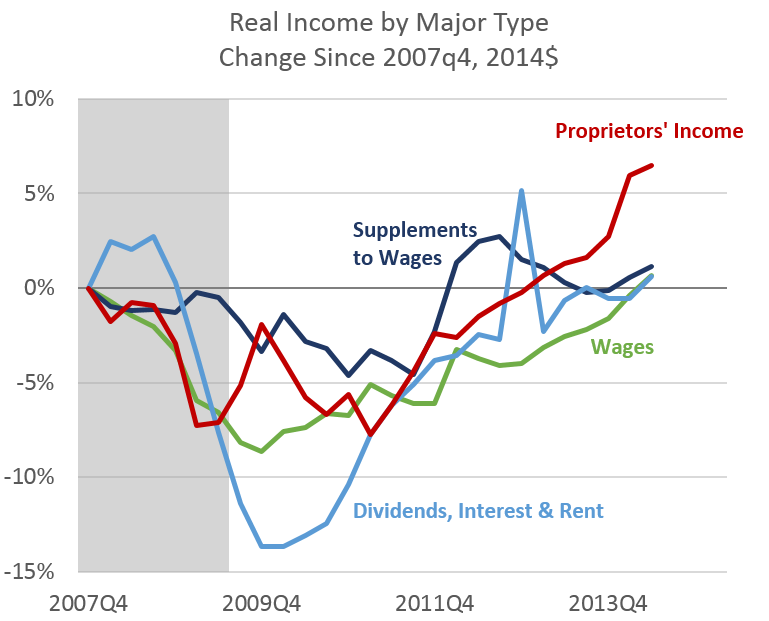 In terms of how some of the major components have fared over the business cycle, the graph below shows changes in inflation-adjusted income for four of the major types of income. Both wages and supplements to wages (effectively, benefits) are now back to pre-recession peak levels. Employment isn’t far behind either. The good news here is that benefits have shown the same amount of growth as wages. Another indicator that shows the recovery has not created just so-called bad jobs (part-time, no benefit, low pay, etc). The spike in dividends, interest and rent at the end of 2012 was the pull forward impact of federal tax changes in 2013 when the Bush tax cuts expired for the highest income earners. Lastly, nonfarm proprietor’s income has done well. This income can be thought of as small business income — partnerships, practices, sole proprietors and the like. Now, not all small businesses have fared well, but some certainly have. These gains likely also reflect the long term trend away from C corporations into so-called pass through entities like S corporations and LLCs and the like.